Char-a-Banc L-shape sofa by Mario Bellini for Cassina consisting of nine parts. Only seven shown on the photographs. Measures: Each section is 27" wide. 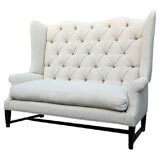 The sofa with all parts assembled would measure 164" x 164"
Monumental wing back sofa with and down seat on a stylized dark wood base with either a tufted or tight back... in natural linen or COM. 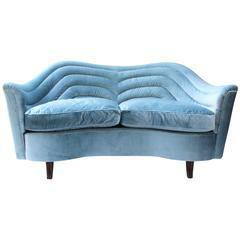 Italian Mid-Century Modern loveseat by Andrea Busiri Vici. Newly upholstered in velvet. 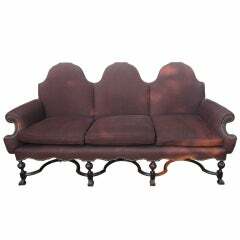 Great hall sofa or settee in the os du mouton style beautifully done up in a raisin-colored corduroy with brass nailheads and down cushions. Handsome black leather 3-seat sofa designed by Mario Bellini for Cassina. Well worn with nice heavy patina. In original condition with visible signs of wear.